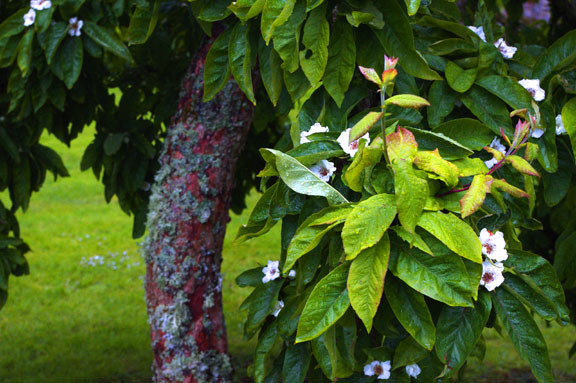 If you’ve looked at our list of what we’re growing there’s this strange name under our Fruit Tree heading – Monstruese de Evreinoff Medlar. If you’re in the U.S. chances are you have no idea what that is. I honestly don’t even know how I found out about it. The “Monstruese de Evreinoff” part of the name is actually the variety. Yes, there are multiple varieties of this fruit tree most have never heard of. So what is the deal with this plant? The Medlar is in the same family as apples and pears. It is a large shrub or small tree with large green leaves and beautiful white flowers native to the eastern Mediterranean region. The fruit is generally small – about 1 1/2″ – 3″ in diameter. The calyx end is much larger than on an apple. You pick the fruit after the first frost. However, it’s much too hard and sour to eat yet. You must allow them to soften or what’s called “bletting” them by storing them in a cool dark place until the skin starts to wrinkle. When the fruit softens it takes on the flavor of cinnamon applesauce. It makes a fabulous jam or heat them up and serve with cream for a wonderful dessert. The Medlar was very popular during the Middle Ages up until the Victorian Era. Charlemagne was a fan of the Medlar, instructing that they were to be planted in the Imperial Gardens. They aren’t as fashionable anymore, but you can sometimes still find them in Europe. In the Middle East, however, they still hold onto some of their popularity. The photos above I took at Cawdor Castle near Inverness, Scotland. I was so excited to come across it because I had actually never seen a full grown one in real life. I have a tiny sapling in my front yard, but that is as close as I had come to one previously. 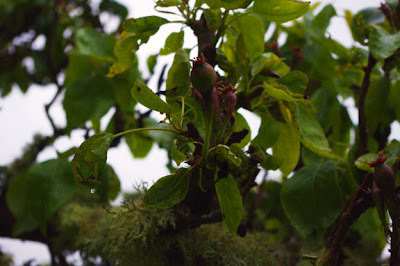 If you are interested in growing one of these interesting fruit trees you can check out Raintree Nursery in Washington State. Right now they are offering them for pre-sale. So far they are the only reputable nursery I’ve found Medlars at in the U.S. They also sell a lot of other wonderful rare and unusual fruit trees and shrubs. Well, the Medlar is a new one on me. I'll have to do some digging to find out what they taste like. I'm moving on to fruit next year, so I need some inspiration! I'm currently reading 'In a Unicorn's Garden' by Judyth McLeod. An awesome history of medieval gardens, fruits and vegetables and cooking, highly recommended!! She's got a section on medlars – I read about them for the first time just last night!